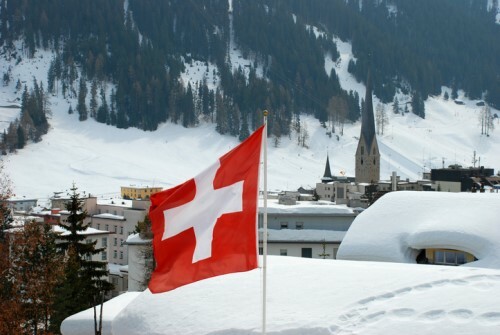 World leaders are meeting in Davos this week for the annual World Economic Forum (WEF), where they’ll discuss how to prepare for what their new report says could be the most dangerous year ever. We’ll hope that they come up with some good solutions, but in the meantime, we’ve been pouring over the Global Risks Report 2018, which leads us to believe that we’ve got one very risky year ahead of us. Cyber risks also rose in the threat rankings for 2018, highlighting their increasingly incidence and disruptive potential. “The aggregate cost of cyber is now estimated by a number of sources to be more than a trillion dollars per year in economic cost versus roughly US$300bn experienced in 2017 from losses from natural catastrophes – and that was a record year,” says John Drzik, president of global risk and digital at Marsh. The economy isn’t top of mind these days, but several underlying issues could make it this year’s sleeper risk. “The global economy has been picking up. This could lead to complacency about many of these risks,” says Drzeniek Hanouz. The IMF world economic outlook recently projected a 3.7% annual growth rate for 2018 – up from 3.2% for 2017. That’s a remarkable recovery from the global crisis a decade ago, but WEF warns that we could currently be seeing things through rose-colored glasses. “There are still serious concerns in societies about whether that growth is translating into broad-based progress in living standards,” says Richard Samans, managing director, WEF. He cites a widening gender pay gap and declining wages as important sources of potential friction. 93% of respondents to the report’s survey said they expect political or economic conflict between major powers to worsen, and nearly 80% expected to see war-related risks emerge. With Brexit, Donald Trump’s presidency and an increasingly assertive China, the world is left without a clear set of norms and direction. That makes it harder for agreements to be reached multi-laterally, further complicating the risk landscape. 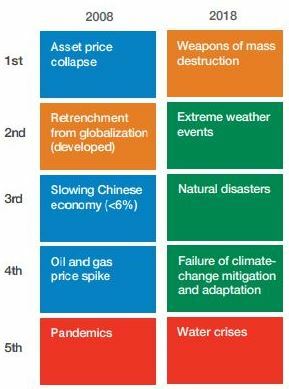 Directionless and without international order, the world could see downward spirals in several areas of the global commons – from disasters in cyberspace and fallout from the failure to mitigate climate change to disengagement and unilateralism as international frameworks weaken, the WEF predicts. 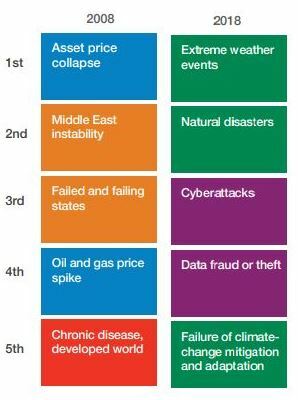 Many of these risks are systemic, which calls for innovative risk management and mitigation strategies. “Humanity has become remarkably adept at understanding how to mitigate conventional risks that can be relatively easily isolated and managed with standard risk-management approaches,” says the report. 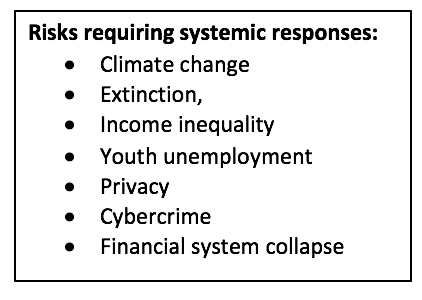 “But we are much less competent when it comes to dealing with complex risks in the interconnected systems that underpin our world.” Without systemic, holistic responses, WEF warns that we could see systemic collapse. 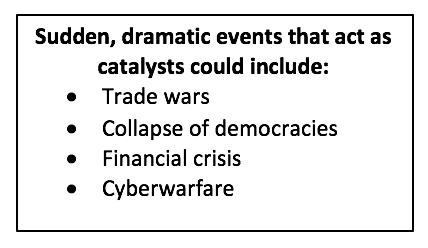 “Future shocks” are black swans – the things that are harder to say will happen, but that we need to entertain hypothetically, as food for thought. With risks intensifying and interweaving across the board, the potential for sudden, dramatic events to become catastrophic can’t be ignored. “It’s important for business to build these emerging risk scenarios in to our strategies to not only manage risks but also to grasp opportunities,” says Scott.